A correctly connected tow vehicle and caravan will make sure you have a stress free journey as well as minimising the risk of any towing related incidents, such as detachments. We’ve seen an increase in caravan detachments over recent years, which can be avoided if you’re hitched up correctly and by making sure the breakaway cable is correctly fitted. Here’s our 14 step guide and video on how to carry out the perfect hitch and correctly connect your caravan to your towing vehicle. 2. Make sure the caravan hand brake is fully on and if on a slope or uneven ground chock the wheels of the caravan too. 3. Raise all the corner steadies on the caravan and raise the nose of the caravan by winding the jockey wheel down. 4. Now it’s time to reverse the car towards the caravan. It’s useful to have some help here. But if you are working solo, and you have a motor mover, use this to pull the caravan forward towards the car. Remember if you are using a motor mover to disengage it from the caravan wheels once you have done using it. 5. With the tow ball now beneath the hitch of the caravan it’s time to start connecting the car to the caravan. Start by connecting the breakaway cable – it’s a legal requirement to have a breakaway cable fitted to your caravanning outfit. Your tow bar should have a dedicated connection for the breakaway cable. If not, you can have one added on to your car. Just speak to your local caravan or car dealer for more information. 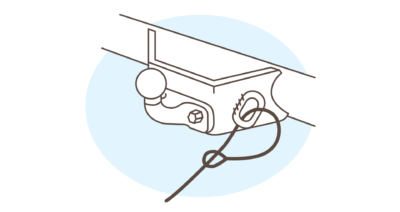 An acceptable method of connecting the breakaway cable is to loop the cable around the neck of the tow bar, beneath the coupling head, and clipped back on itself. Make sure the cable doesn’t get entangled with the electrical cable or any external stabiliser and that it’s not dragging on the ground when driving. Be sure to replace a damaged breakaway cable with the relevant manufacturer’s spare. 6. 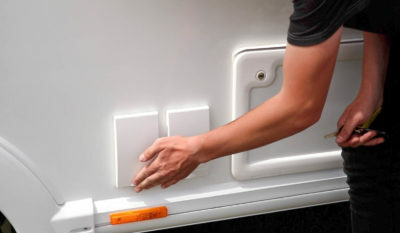 Now open the hitch handle and lower the nose of the caravan onto the tow ball until you feel the caravan connect and you see a green indicator on the hitch to let you know the caravan is connected. 7. At this point it’s vitally important to check the caravan is connected. You can do this by winding the jockey wheel down so the nose of the caravan is being lifted. 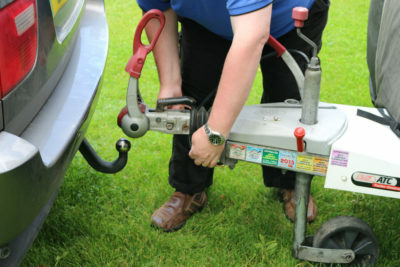 The back of the towing vehicle should be lifted, and no indication that the towbar has detached from the caravan hitch. 8. Once happy wind the caravan back down and stow away the jockey wheel by winding it up and locking it in place. Make sure the jockey wheel clamp and jockey wheel winder are both tight. 9. Connect the electrics from the caravan to the car. If you have an older caravan you might have two plugs. On newer style plugs you’ll need to insert and twist the plug to make sure it’s connected correctly. Check the electric cables are not loose on the floor, so they can’t get damaged. If they are loose, you can tie them up with some bungee cords. 10. Next, engage the stabiliser (if you have one) and with the car handbrake fully applied, release the caravan handbrake. 11. Moving away from the hitch it’s now time to check the lights are working on the towing vehicle and the caravan. Be thorough here by checking that the right lights come on when pressing the brake pedal, for example. So, starting with the brakes, ask someone to shout what lights they see when you press the brake pedal. Move onto the hazard warning lights, then the left and right indicators. Switch on the side lights, and check the rear fog lights, and reversing light (if you have one) are all working correctly. It’s also important to check the marker lights on the caravan, and make sure the lights are still functioning on the tow car too. 12. Once you’re sure all lights on your outfit are working, it’s time to check all the lockers are closed and locked, and that all windows and service flaps are securely shut and that the gas supply is turned off. Finally lock the caravan door. 13. Do a final walk around and last re-check of the hitch and breakaway cable to check that everything is in place. 14. Pull forward and check the ground for any items. If you’ve used chocks, don’t forget to collect them, and then you’re good to go. Got any more tips on hitching up your caravan? Feel free to share in the comments box below. Happy caravanning! Thanks Stephen. We hope to clarify and provide more detail in a future video on breakaway cables. With respect, you have missed the point I made, ie you say “appreciate that in going forwards the breakaway cable may not operate initially – but if it rolled backwards it would do its job and apply the brakes – albeit under such a low speed it would probably not snap.”. It will snap as the ‘van is not likely to be moving (unless hitching up with a motor mover’) and it’s the car that would be moving and so yes, as you say, the ‘van brakes will apply but then the cable will snap if the car is moved more than the length of the cable, which is very likely! Check the hitch weight prior to hitching especially prior to motorway trips. Quick and easy to do as part of the hitching process. Thanks Tony. Nose weight will be the subject of our next video. Thank you to David Dent for pointing out the difference between braking cables ending in carabiners and those ending in clips, two distinct types. An excellent Caravan Guard guide from 2015 confirms David’s advice; clips must be used only to double back and clip onto the cable itself – carabiners can be used for direct attachment to the vehicle. Even if there is varying advice on this, surely there’s no point in taking a chance on this vital attachment? It’s clearly a hot topic Jenny and we’re looking into producing a more detailed video just on breakaway cables in the future. Anyway, I bet I’m not the only one with this rule: First stop, tyre pressures. I drop off at the local garage which kindly checks my van tyre pressures free for me. (Trying to get a caravan into a garage forecourt tyre pressure bay would be silly when I can just smile nicely at the lovely guys at National Tyres!) I always do my car pressures at the same time, before every trip, however often I go. Just a pound can make a real difference to handling. In France, there don’t seem to be so many DIY pressure gauges, but I understand that every garage is obligated to give a free tyre pressure check on request. Maybe this is not strictly part of hitching up, but to me it is, just as a final check of your mirror positions when you’re on the road is part of the hitching up process. Thanks Jenny. Some great tips and yes important to check your tyre pressure. Years ago the Caravan Club reported that its insurance policies were paying out 100 or so policy holders per year on claims due to the wrong ball being fitted. So Liz, what happens when you get stopped by the Traffic Commisioners? AS I did and they put a Prohibitation order on me not to use vehicle that way and had to get dealer to modify, buy putting a U-clamp round kneck of towbar. I can’t comment on individual police forces. We’ve checked with our caravan safety expert who also attends DVSA roadside checks and he says it is legal to loop around the ball assembly on a tow bar where there is no designated attachment point. You might also want to check here: https://www.gov.uk/guidance/tow-a-trailer-with-a-car-safety-checks#tow-ball-and-connections Note they put the breakaway cable on AFTER hitching up in the video. Sorry the advice differs to the blog post specifically about breakaway cables but in the video we were trying to highlight the hitch up process per se, using the NCC’s towing guide. Given that breakaway cables is such a hot topic, we’re looking to produce a video in the future specifically about this subject in liaison with an expert from the new Towing Group, which includes the National Caravan Council and DVSA. In our future video we’ll make sure this is highlighted. I don’t seem to be able to add to my original post and your reply but your article on Breakaway Cables of 12/6/15 gives the information I am pointing out. 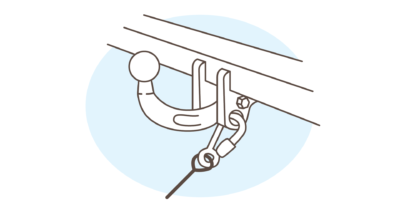 Where a designated attachment point is provided, either pass the cable through the attachment point and clip it back on itself (Fig 1) or, if the clip is designed to be used in this way and this method is permitted by the trailer manufacturer, attach it directly to the designated point (Fig 2). Refer to the caravan’s handbook for guidance. If you look at the manufacturers descriptions of the clips you will see that the lighter spring typeclips are designed to be clipedback to the cable, the carabiner type clips can be clipped direct to the attachment point. The spring type clips are not as strong and if used as in the video, clipped directly to the attachment point can fail by straightening before the caravan brakes are fully applied. 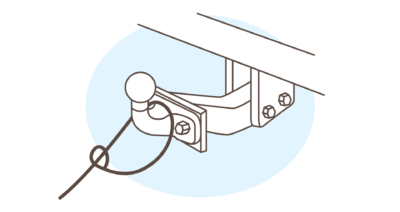 Most caravan manufacturers fit the spring type clips because they are cheaper but if connected properly by looping back on themselves, either through the attachment point or around the tow bar, will apply the caravan brakes fully should it become detached from the tow vehicle. Thanks. This will be covered in one of our next videos. Regarding the hitch lock, it’s mandatory on my insurance policy when the caravan is stationary. I fit it at hitch time in case I have to leave the car (e.g. go into services). After a couple of hours driving, and then needing the loo I might well forget to fit it. Tyre pressures on car and caravan. Wheel nuts on caravan with torque wrench. Green light on ATC. Mover off and red key out. Check mirror extenders when in a straight line. Check number plate has not fallen off (happened to me once, they are only held by sticky fixers). Internal checks… Fridge is shut (we leave it slightly open when in storage). Blinds are up (we have them down in storage). Aerial down and locked. Top vents are down and locked. Thanks for the extra tips Kevin, particularly fitting the hitch lock when at the service station. It is against the law to wrap the break away cable round the tow hitch, the bolts on the tow hitch are the weakest point. The breakaway cable must always be hooked on to the towbars appointed anchor point. After engaging the motor mover with the long wheel nut wrench, immediately place it on the driver’s seat. That way you can’t drive off forgetting to disengage the mover. Thanks Phil – good advice. Thanks for your comments Jack. With regards to Ray Noble’s comment re the ‘red key’. These are standard marine power keys and can be purchased for just a couple of quid each. They are not special, so don’t pay a lot for one if you lose yours and also, get a spare just in case! I actually keep one ties to a piece of string inside the battery compartment so it’s always there. Excellent advice apart from simply looping the breakaway cable I’ve the neck of the tow ball is very unsafe as, if the coupling does fail and jumps upwards over a bump, Sod’s Law says the cable will follow! A closed-loop to pass it through, then snapped back onto itself is the only way to go. I instructed on the Caravan Club courses for many years. Thanks for your comments Simon. 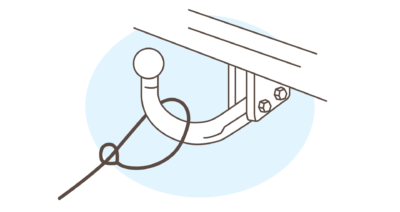 The advice from the National Caravan Council (NCC) is “where no designated attachment point is provided, the cable should be looped back around the neck of the towball using a single loop only” as shown in the illustrations. I noticed the gas pipe was still connected to the bottle. I was once told that the best bet is to actually disconnect the pipe too because in the event of an accident, if the bottle comes loose and falls out it can damage the bottle connector and cause a leak of gas. Having said that, there are many vehicles that need gas on to power fridges, etc (motorhomes rather than vans?) and of course, gas/LPG powered vehicles! I suppose it’s down to your level of concern for safety? Another tip is when you arrive at your destination, release the Stabiliser as can make manoeuvring the van easier and takes any stress of the stabiliser too. Not sure it’s a good idea to attach the break-away cable before you have hitched up. If you don’t have a mover then it’s quite easy to move your car forwards to reposition it for hitching up more than you expect and in this case, if the cable is attached, you are going to snap it! Only attached the cable once the ‘van is securely hitched up. Once the car is underneath the hitch, it’s good practice to attach the breakaway cable first, as advised by the NCC and instructed in the B + E licence examination. Hope this helps. In the picture for point 6, (lowering the van on to the ball) I find it helps to have the hitch lever’ raised also as it gives a very reassuring ‘clunk’ when it seats on the ball. Also, before hitching up, make sure the ball is clean ….. the Alko stabiliser will not work effectively if there is any sign of grease. Before un-hitching, I engage the mover rather than put the handbrake on and move the van back just enough to extend the hitch. That stops it marking the rear valance when the van is raised off the ball … but don’t forget to put the handbrake on first. In respect of checking the lights it’s an excellent idea to keep your foot on the brake pedal whilst checking all the lights. The reason being that it’s not unknown for a poor connection to cause all sorts of “interesting ” light combinations when more than one circuit is powered up. I have seen all sorts of anomalies, indicators glowing when the brakes are applied, or brake lights flashing when the indicators are used. These sorts of problems will ONLY be apparent if the lights are used in combination rather than individually. So keep your foot on the brake pedal all the time you are checking the lights to make sure all is well! As you say, it’s acceptable (though not ideal) to loop your breakaway cable round the tow ball – but not if you have a detachable tow ball. In that case, the cable should be connected to the fixed tow bar base, through the dedicated cable attachment point. I have watched a professional (caravan supplier) hitch my caravan and commit this error, so be super-careful out there! Thanks Jenny. Some detachable towbars do not have a designated attachment point, so it’s advisable to seek guidance from the towbar manufacturer or supplier on how to attach the breakaway cable. Put a leg down at front if you need to adjust jockey wheel to allow more height to fit over tow bar. Hubby loosened the jockey to adjust and caravan slide down jockey and was nose on floor. Warden helped by telling us to raise legs to get it back up! Do not forget to release the handbrake before using your motor mover or you will chew your tyres up. Don’t ask how I know this. This is excellent advice for novices. 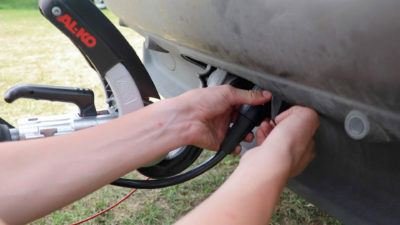 The point about winding up the jockey wheel, lifting the rear of the car to check the connection between car and caravan is secure, is a new one to me and I will certainly do this in future. I’d add one further piece of advice, which to to make sure the notches on either side of the outer post of the jockey wheel are lowered over the wheel bracket to stop any movement of the wheel when travelling. I have had experience of the inner post of the jockey wheel loosening and dropping, so the jockey wheel hits the ground in transit. I hope I have explained this properly. Thanks Paul. Another great tip. I also check to ensure that ( after disonnecting the motor mover from the wheels) the red key that provides the power to them is turned off, before locking the battery locker. The connection of the breakaway cable in the video is WRONG. The cable shown has a spring clip and therefore is only designed to be fastened by being passed through or around the connection point and looped back on itself. if used as shown the spring clip is not strong enough and may straighten before the caravan brakes are fully actuated. In order to clip the breakaway cable directly to the attachment point a cable with a cable with a carabiner type clip must be fitted. Hazard warning check is sufficient if normal “clicks” are heard. Any speed change of klicks will show up a dud lamp. If you have to use a mover, as we do to get our van of its storage site to hook up position, not to forget to wind back the movers rollers or at least check. Thanks Kev – really good comment. We’ll add it to the blog. Thanks Graham. And hopefully a good refresher for experienced ‘vanners too! Should you travel with the hitch lock on or will this stop the caravan from disconnecting in the event of the van rolling in a accident which would result in the car being turned over also ?? Remember to disengage the motor mover from the caravan wheels! I have missed this a couple of times and wondered why the caravan would not move! I was taught to make sure the jockey wheel was running freely when clamped up – otherwise if the wheel hits the road surface going over a hump you’ll scrape all the rubber off its tyre! Thanks Peter. Consider the height of the tow ball, and in some instances the jockey wheel is retracted away and held within the A frame, so unlikely to touch the ground. It might be worth speaking to your local dealership for your towcar and have the height checked for clearance etc. 15. Fit your rear view mirror extensions and adjust them correctly while the car and van are in a straight line.